Craig Bourgeois and Marco Abruzzi clinched NHRA Lucas Oil Drag Racing Series national championships and Janette Thornley scored the NHRA Harley-Davidson Drag Racing Series national championship at the Division 7 NHRA Lucas Oil Drag Racing Series Short Line Express Gambler Shootout at The Strip at Las Vegas Motor Speedway. 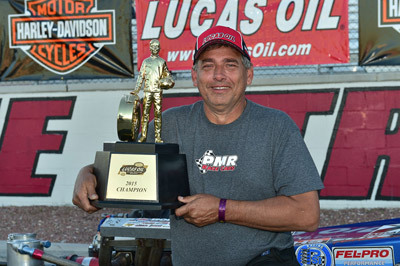 Bourgeois had a late season run that included four wins and a pair of runner-ups in his last six events to earn the Comp Eliminator championship. The Metairie, La., racer came into the eekend with a 22-point lead over Arnie Martel, the only driver that could catch him. Both drivers marched through eliminations with Martel needing to win the event to overtake Bourgeois. Martel lost in the semifinals while Bourgeois advancing to yet another final round. Bourgeois had six wins on the year including national event wins in St. Louis, Dallas, and Las Vegas. Abruzzi came into the event being chased by Matt Driskell and Jesse Adams, both of whom dropped out, early ending their championship hopes. J.R. Baxter also had an outside shot at the title but needed to win the event but lostin the semifinals, locking up the championship for Abruzzi Abruzzi, out of Warren, Ohio, had a pair of wins in four final rounds in his championship run, winning the national event in St. Louis and the divisional event in Norwalk, Ohio. 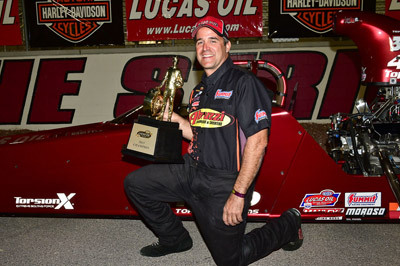 In the NHRA Harley-Davidson Drag Racing Series, Tommy Grimes had already locked up his national championship in Top Fuel Harley with five wins. 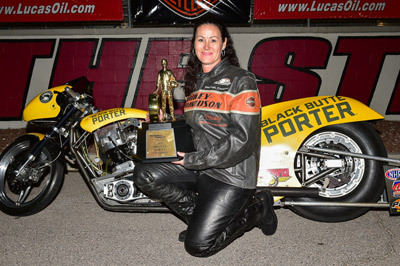 In the Pro Fuel Harley class, it was Thornley trailed points leader Dennis Fisher by just five points coming into the weekend. Thornley won in round one, then watched Fisher lose to David Larson, giving her the championship. Thornley, of Statesville, N.C., advanced to the final round before losing to teammate and last year’s Pro Fuel champion Johnny Vickers. Thornley took home four event wins during the year to go along with the season championship. The remaining NHRA Lucas Oil Series National Championships will be decided at the Auto Club NHRA Finals at Auto Club Raceway at Pomona. Reigning Top Alcohol Dragster champion Chris Demke hopes to hold off Joey Severance who would need to reach the final round to overtake Demke. 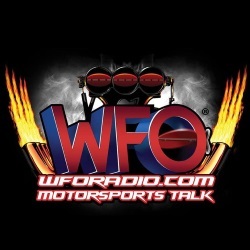 In Top Alcohol Funny Car, Jonnie Lindberg leads Annie Whiteley by a single point with John Lombardo Jr. and Doug Gordon still in the fight as well.